The sun edged down toward the western horizon, its face now broken by the pointed spires of the pines and firs growing along the river. The sunlight, filtered through the evergreen branches, broke and scattered, shifting diamonds of light on the rippling water. 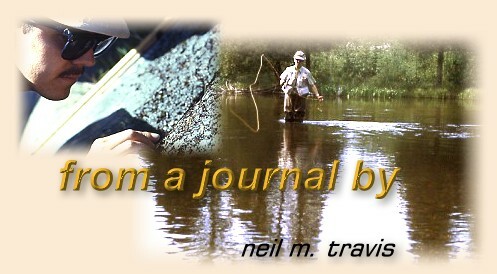 Sitting on a streamside log a lone angler contemplated the scene before him. Leaves, golden gliders pushed by the soft breezes of evening, settled onto the stream, golden reminders that another season was at hand. How quickly, like the vanishing snows of winter, had the hopes of spring melted into the reality of summer, and now into the inevitability of autumn. In the spring the stream had run full from bank to bank, its waters dark and mysterious. Under the warmth of the spring sun the stream came alive with new life. Mayflies, tiny ephemeral sail boats drifting down sheltered glides, fluttering and falling, struggling to gain safety of the streamside foliage. The evenings had been filled with their mating flights, exquisite dancers on jeweled wings. Hendrickson's, sulphurs, cahills, each came in turn as spring flowed into summer. With them came the caddis casting aside pupual shucks, skittering across the water, to join their fellows on nearby trees to dash and dart about the branches seeking mates. Evening flights were often like miniature snowstorms as they swirled over the water. All of them were gone now; even the tiny late season mayflies. Tricorythodes and Pseudocloeon had completed their cycle and in the gathering darkness of this the final day of trout fishing only a few midges danced over the riffles. It had been a tough season. The proceeding winter had been long and cold. Spring brought high, cold water, and summer was marked by hot, dry days. The stream had suffered. Fishing pressure had been heavy this season, and never before had he witnessed so many anglers here. By early summer many runs were devoid of fish. Many of the late season hatches had gone unmolested except for small brookies and chubs. The angler lit his pipe and watched the smoke drift away downstream. An errant nighthawk wheeled over the stream, his plaintive call went unanswered since most of his kind had long departed for warmer climes. A Woodcock on stubby twittering wings flew from the tag alders at the edge of the stream and disappeared into the bog beyond. It was a short walk through the woods from here to where he had parked his car earlier in the day. An afternoon of fishing had produced only small brook trout. The males were bright jewels already arrayed in spawning colors. Each had been admired and carefully released as this was the angler's policy with all trout. He had hoped for one brown on this last day of the season, but they were conspicuous by their absence. Now he affixed a grizzly skater, tied on a tiny hook, to the end of his tippet. Perhaps he could imitate the hovering midges as they danced over the water. Moving upstream he probed each pocket, each glide, each slick. With practiced perfection honed from years of experience and knowledge of the stream he fished each spot, recalling from memory each nuance of current. Several times in one year he had taken a 15 inch brown from behind that log, but now his fly danced there without bringing any response. Near the bank some underwater rocks, placed there by the angler himself, usually provided a lie for a good fish or two, but tonight they hid only a chub. The sun had set now, setting fire to the western horizon in a palette of colors only the Master Creator could devise. The family would be wondering where he was so long, and there was a long drive ahead of him that would take him back to the city. He would make a few final casts, then good-bye until spring.